This book looks back on forty years of writings from Food First/Institute for Food and Development Policy on the occasion of its fortieth anniversary. 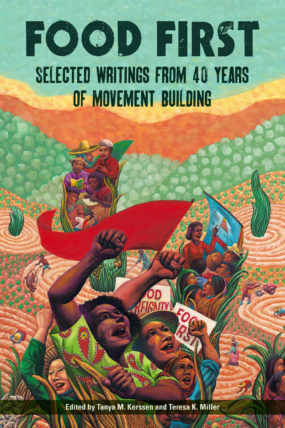 The book highlights the breadth and depth of the organization’s published works, addressing issues such as hunger, international trade, US foreign policy, the Green Revolution, agroecology, land reform, food and farm workers’ rights, climate justice, and food sovereignty. For four decades, Food First has been generating progressive analyses of development issues at home and abroad, and amplifying the voices of local and global movements for peace, social justice, human rights, and the right to food. When we look back, we are amazed at the breadth of topics Food First has taken on over the years, speaking to the timeliest challenges facing humanity while always highlighting the struggles of ordinary people. We are humbled by this remarkable history because it reminds us that we stand on the shoulders of visionary analysts and activists like Frances (“Frankie”) Moore Lappé, Joseph Collins, Walden Bello, Peter Rosset, Medea Benjamin, Christine Ahn, Raj Patel, and countless others—who pushed the envelope and gave us new ways of seeing the world. As part of Food First and beyond, they exploded the myths that, as Raj says, “do a lot of thinking for us.” Food First’s goal, then as now, is to give people the tools to take back the power—to think for themselves; to understand how our food (and economic) system works; and to engage in deeply informed activism. The 1977 book Food First: Beyond the myth of scarcity is Food First’s hallmark (and namesake) publication. Frankie and Joe’s pioneering book argued that the root causes of hunger were not to be found in underproductive agriculture, the whims of nature, or insufficient food aid—but rather in an unjust distribution of wealth, resources, and political power. The implications of this analysis are far-reaching: only through a radical reorganization of society will we achieve genuine solutions to poverty and hunger. This book brings together selected writings from Food First’s rich 40-year history, organized around some of the critical themes and questions that have guided our work and activism over the last four decades. The 1970s and ‘80s saw a number of struggles around the world fighting for precisely this kind of radical change—including revolutionary movements in Central America. Through its solidarity activism and publications, Food First provided a window onto these movements and the US-supported campaigns to crush them. Foreign aid, Food First pointed out, often worsened hunger and dependency, fanning the flames of conflict rather than promoting peace and development. And in the 1980s and 90s, when the aid agenda turned into a “free trade” agenda with the creation of the World Trade Organization (WTO) and the North American Free Trade Agreement (NAFTA), Food First continued to inform the public about the devastating consequences for countries of the Global South as well as for workers and farmers in the United States. In numerous publications, Food First outlined the disaster of neoliberal globalization, including Chile’s Free Market Miracle by Joe Collins, A Siamese Tragedy by Walden Bello, and Shafted: Free trade and America’s working poor by Christine Ahn. From the wreckage of neoliberal globalization, which pushed people—especially communities of color, women, peasants, and indigenous people—to the edge of survival, new movements emerged such as the Zapatistas in southern Mexico; the international peasant movement La Vía Campesina with its cry for “food sovereignty”; Brazil’s Landless Workers Movement (MST); and the US community food security movement. Food First participated in many of these movements—organizing, protesting, debating, giving congressional testimony, teaching courses, leading delegations, and facilitating workshops. In recent years, we have witnessed and celebrated the unprecedented advance of people power around the world. In the US, Occupy Wall Street, the climate justice movement, food and farm worker organizing, and anti-racism protests have contributed to a richer definition of “food justice” and broader alliances for transformation. Informed by global peasant movements, the UN now touts agroecology and peasants’ rights as the way forward. This book brings together selected writings from Food First’s rich 40-year history, organized around some of the critical themes and questions that have guided our work and activism over the last four decades. They demonstrate both the evolution of Food First thinking and the continued relevance of early writings by Food First thinkers. We also know that the issues we address going forward will shift and evolve in lock step with global struggles for justice, and their ever-expanding power, creativity, and visions of a better world. As we look around us in 2015, we are energized, inspired, and eager to face the future arm-in-arm with the vast family of supporters, allies, and friends who have shaped 40 years of Food First. We hope you enjoy this book, which is a chronicle of our shared journey. Tanya Kerssen writes and teaches on the political economy of food, agriculture, and rural development with a focus on Latin America and Africa. She holds an MA in Latin American Studies from the University of California Berkeley and is the author of the Food First book Grabbing Power: The new struggles for land, food, and democracy in Northern Honduras. Teresa K. Miller holds an MFA from Mills College and is the author of sped (Sidebrow) and Forever No Lo (Tarpaulin Sky Press). Her essays and other writings have appeared in more than two dozen publications, including Common Dreams, AlterNet, and FoodFirst.org.